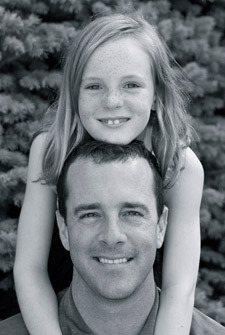 Dr. Kyle Buckle and his daughter. When Dr. Buckle was a teenager, he experienced an injury after working in his father’s warehouse that severely affected his health. Surprised to hear his mother suggest he visit a chiropractor, Dr. Buckle took her advice, as he was desperately seeking pain relief. Dr. Buckle was amazed at how great he felt after his first visit—so much so that it piqued his interest for the rest of his life. Dr. Buckle attended the renowned Palmer College of Chiropractic in Davenport where he obtained his Doctor of Chiropractic. While in college, he discovered his deep passion for working with all different types of patients to restore their health. To this day, he continues to work to help the Livonia community live healthier lives through natural and gentle chiropractic care. He loves seeing the progress that his patients have made and continue to make. When he isn’t helping patients feel better at Buckle Family Chiropractic, Dr. Buckle enjoys spending time with his daughters, Kira and Anneliese whom he describes as the light of his life, and his wife, Sarah. He is an avid Crossfiter at Crossfit Lower Town and loves being involved in the local community, listening to music and playing golf. Get to know more about Livonia chiropractor Dr. Buckle by booking your visit today!